A seed library is a place where community members can get seeds for free or for a nominal fee. 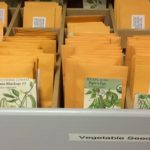 Many seed libraries are open in public libraries and community centers – UGA’s Gwinnett Extension office has a seed library! Seed saving is something humans have done for over 10,000 years and on February 18 at 11:30am, Cherokee County Extension Agent, Josh Fuder will help gardeners rejoin the ritual with a presentation on how to start saving seeds and sharing the abundance in our community. Fuder’s seed saving experience stems from his studies at Oklahoma State University where he graduated with a B.S. In Horticulture and Landscape Architecture and a M.S. in International Studies. He served with the Peace Corps and now continues to combine his love of plants and desire to help people, in his community in Cherokee County. During this presentation, Fuder will discuss various strategies for successfully collecting and storing a variety of seeds, as well as share tips for starting a seed library in your own community or garden club.